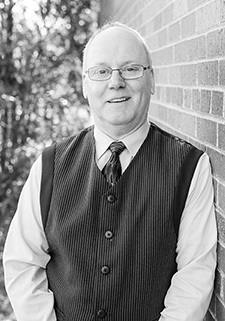 Professor MacDonald joined the music faculty at Winona State University in the fall of 1996. He holds Bachelor of Music and Master of Music Education degrees from the University of North Texas, and the Doctor of Arts degree in Percussion Performance and Pedagogy from the University of Northern Colorado. Dr. MacDonald has taught extensively in Texas, serving on the faculties of the University of North Texas, the University of Texas at Arlington and Eastfield College. Some of his performance credits include: Milt Hinton, Slide Hampton, Arturo Sandoval, George Benson, Eddie Daniels, and three years touring experience with Ice Capades. Dr. MacDonald performs regularly as a drummer and vibraphonist at jazz venues in the Southeastern Minnesota, Western Wisconsin region. He is also principal percussionist with the La Crosse (Wisconsin) Symphony Orchestra. As a drumset and percussion specialist, Dr. MacDonald has presented clinics throughout the U.S. and Canada. He is an endorsee of Sabian cymbals and Vic Firth sticks and mallets, serving on their respective education teams. He is also a contributing author to Percussive Notes - official magazine of the Percussive Arts Society.